It’s that time of year again for our Spring flower sale. Flowers cost $18 each. The sale will run through April 27. 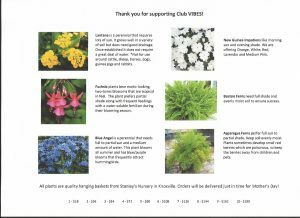 Beautify your home all while supporting Club VIBES. These flowers also make a great Mother’s Day gift. For more information, see the attached forms or email us at info@club-vibes.org.